Air conditioner filters are an important part of ac maintenance in Burlington. You are here: Home / HVAC Info & Articles / Articles / Are Air Conditioner Filters Recyclable? Are Air Conditioner Filters Recyclable? It’s recommended that air conditioner filters be replaced at least every 3 months. Filter replacement is part of typical AC maintenance in Burlington. If you have regular maintenance in the spring and fall, your filters will be replaced every 6 months, so it’s a good idea to change them out yourself in between tune-ups. You can even change them monthly for best results. That’s a lot of trash being generated that may just end up in another landfill. Can AC filters be recycled? Well, it depends. Can I Put My Used Filters in My Curbside Recycling Bin? Unfortunately, no, unless you want to meticulously separate the polyester or fiberglass mesh from the cardboard border and recycle just the cardboard. But that process is tedious and it releases all the dust mites and allergens that your filter has removed from the air in your home, exposing your respiratory system to toxins. If you have allergies, asthma, or any other respiratory illness, the potential harm is just not worth it. Where Can I Recycle My Used HVAC Filters? There are a couple of options for recycling air filters. Mail-in recycling services will send you prepaid envelopes in which to place your dirty filters to send in for recycling. Contact your HVAC service and ask about filter disposal/recycling for those filter changes in between your twice-annual HVAC tune-ups. Of course, the easiest method is to simply throw them away in your curbside trash can. However, taking the time to avoid adding more trash to landfills is a noble cause. Another way to keep filters out of landfills is reusable filters. Reusable filters can be cleaned periodically and last for years. The price is higher than disposable filters, but you’ll avoid repeatedly paying for disposable filters every 3 months. And you’ll eliminate waste while still keeping your indoor air clean and healthy. Remove filters from intake vents. 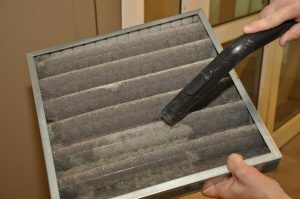 Vacuum or hose off filters until dust and debris is removed. If you use water, be sure to let filters dry completely (this step is very important, otherwise unwanted moisture ends up in your HVAC system and mold can grow). Put filters back in the intake vents. These filters will last for years, eliminating particles and allergens from your home air and keeping your HVAC system clean. All of your filter changes can be handled by Alamance Oil. You can order filters at Berico.com for replacements in between tune-ups. Otherwise, your filter replacements can be handled by Alamance Oil during your regular appointments for AC maintenance in Burlington. Sign up for a Comfort and Protection Service Agreement and your filter changes and disposal are included. Keep your heating and air conditioning system running efficiently with full system care from Alamance Oil. Call (336) 226-9371.
https://www.berico.com/wp-content/uploads/2018/12/header-logo-new-3a.png 0 0 Team Berico https://www.berico.com/wp-content/uploads/2018/12/header-logo-new-3a.png Team Berico2018-05-02 19:08:502018-05-29 19:41:55Are Air Conditioner Filters Recyclable?